Liverpool’s Blueprint is the first publication – in e-book format - under the Writing For Charity banner. What is Liverpool’s Blueprint About? 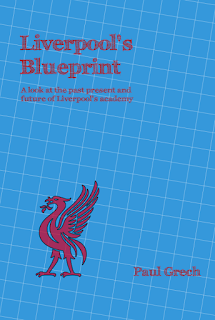 Essentially, it is a look at Liverpool’s academy system over the past two decades, how it has developed, the challenges that it has faced and its current situation. There is no talk on promising players but, rather, it is a general look at Liverpool’s philosophy for developing players. It also analyses why, from one of the leaders in this area – a club that could develop a multitude of top players – Liverpool’s youngsters could barely make it into the club’s own reserve side and how this situation has changed once more. If you’re a Liverpool fan and have an interest in the club’s future then you’ll probably enjoy this. It is not a long read (which the price reflects) and if you don’t like it just let me know and I’ll issue a refund. Over the past five years I have been writing and thinking a lot about youth football through Blueprint for Football, and I’d like to think that I’ve developed an ability to ‘read’ what happening at the club. For a long period it was extremely depressing but I would (cautiously) say that it is now looking quite positive. Although I do have a couple of contacts within the academy system, I did not ask them for their opinions much less quote them for this book. Frankly, I did not want to put their job in any way at risk. Instead I have used public sources, meaning interviews published in the past to back up my arguments. To minimise costs I have done everything myself from designing the cover to proof reading it. As such, please bear with me if you come across any grammatical errors or do not really like the design. Hopefully, if this first edition goes well, for future books I will be able to count on additional support that will make the whole look and feel better. That said, I am extremely confident in the quality of the writing. What is Writing for Charity? Although I love writing and am always trying to get my work into publications that are willing to pay for my articles, thankfully my living does not depend on it. That is something about which I’m very thankful so I’ve decided that all the money made from the sale of this book till the end of December 2015 will be donated to charity. My ambition is to write one such book each year. Hopefully, this will encourage others to do likewise in the process. Indeed, if there is anyone who is looking to do a similar project I encourage them to get in touch so that I can help in any way possible. Each month I will publish the number of sales made, how much money was generated and the costs that these involved (in the form of Payhip and Paypal charges). The net amount will be donated to Alder Hey Children’s Hospital. Why Alder Hey Children’s Hospital? As a father of three children, I can think of very few things worse than serious illness to them. As such I went for an organisation that does a lot of work to help cure children. If there are other books in the future then the plan is to go for another charity, perhaps one that works directly with football. Frankly, I’d be happy with £10. The way I see it is that if I hadn’t done this then that £10 wouldn’t have been donated. The truth, however, is that I’d be disappointed if this doesn’t raise at least £150, given the amount of work that has gone into it. Anything more than that and I’d be ecstatic. Why Only Till The End of December? First of all, I do not imagine that there will be many sales after the initial rush which, from past experience, last some month and a half. If sales are still strong in the third month then I will most probably extend it. At some point, however, this will become a for profit only so that any money raised can go to supporting Blueprint for Football and next year’s edition of Writing for Charity to help make it better (by getting a professional designer to work on the cover, for instance). The decision to go with Payhip is a purely financial decision. Their current policy is that, as soon as a sale is made they deposit the money into my account. Amazon, whilst undoubtedly being a bigger and more established e-book seller, only pay you once you hit $100 (or £100, depending on which store you are selling). This would have meant that in the case that sales did not match those figures I wouldn’t be in a position to make the donation at all. Additionally, on Payhip is technically better as you can put for sale books that can be read on a Kindle, on any device that reads ePub and PDF, something that isn’t possible on Amazon. Apart from that, I have published other e-books on Amazon and it would have been a bit complex to determine which money was being generated by other books and which by Liverpool’s Blueprint. Only that I hope you enjoy the book and let me know of any feedback that you might have. Also, if you do like the book, make others aware of it so that we can raise as much money as possible.